People, especially Americans, love to eat pizza. A good (or bad!) crust is the foundation of any pizza, and is usually white (i.e. made with white flour) or wheat (made with wheat flour). It can even be stuffed with cheese! The other main components of a pizza are the sauce and the cheese. The bits and pieces that get added to the cheese are called toppings. The combinations of ingredients and toppings are endless and can cater to just about anyone’s taste. It’s amazing how different pizza can taste because of individual ingredients. Restaurants and pizzerias have their own signature flavors, and a cheese pizza at one place can taste completely different at another. Pizza is easy to make fresh at home, but frozen pizza and ordering pizza are a lot more common. After all, a big draw to pizza is its convenience! Size: What size pizza do you want? An individual slice or a whole pizza? Small, medium, large, or extra large (x-large)? Crust: White crust or wheat? Stuffed crust (more cheese!)? 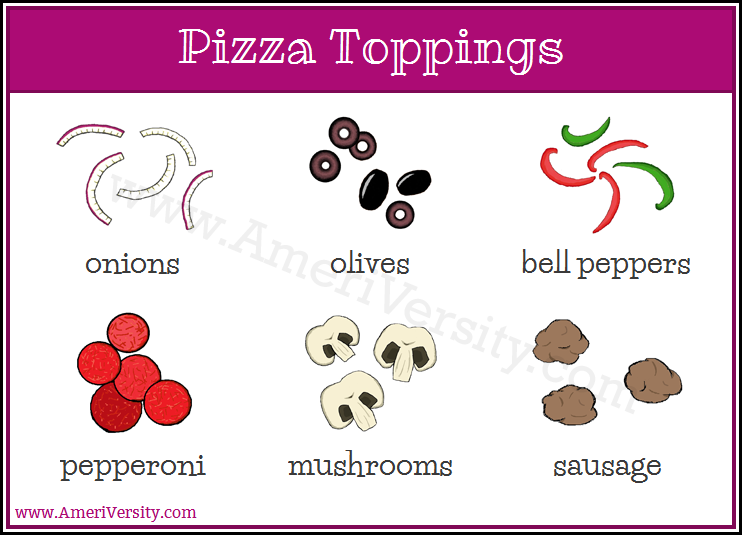 Toppings:What do you want on it? Choose your toppings! Think carefully before you place your order. But then again, if you choose poorly, buying another pizza couldn’t hurt!